Finally, the root and TWRP custom recovery is available for Samsung Galaxy Note 5 Android device. If you are a note 5 user and want to enjoy the rooting feature on your device to take the advantage of the root. 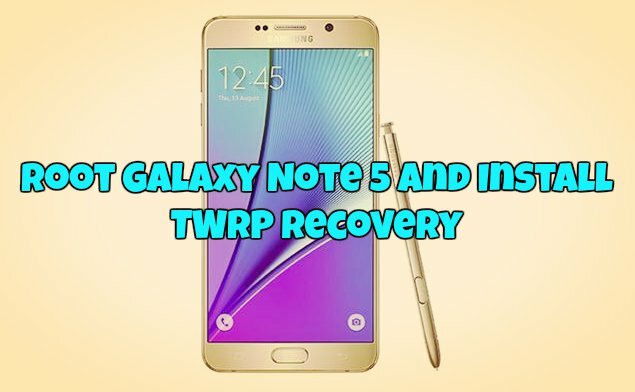 Here in this tutorial we’ll show you how to root and install TWRP custom recovery on Galaxy Note 5. We all know that rooting has lots of benefits, once the phone or tablet is rooted you can enjoy lots of custom ROMs on your phone, install rooted apps, take nandroid backup and system backup etc. To root note is s simple process and all credit goes to the XDA member Manh_IT, all you have to flash the custom kernel on your phone with the help of ODIN flash tool get the root access and to install the TWRP you have to flash the TWRP image. Currently, the rooting method is available only for SM-N920T and SM-N920P Galaxy Note 5 models and very soon other models will get the same. Before following the below mention, tutorial do take the full backup of your phone, check our guide how to take the complete backup of an android device here. Read all the instruction very carefully and follow all the steps. Step 1. As we mention above that this method will work on only SM-N920T and SM-N920P Note 5 models. Download the Noble Kernel zip file and extract it on your desktop. Step 2. Download the ODIN flash tool here to flash the kernel on your phone. Extract the folder on your desktop. Step 3. Now Turn off you phone and boot in download mode, press volume down, power and home buttons at the same time to go to Download Mode and connect your PC to your Note 5. Step 4. Now run the ODIN.exe file from the ODIN folder that you saved on step 2, and click on the AP button. Navigate to the folder where the extracted Noble Kernel file is and select it. Make sure re-partition is NOT ticked under the Options tab. Step 5. Click the “Start” button at the bottom of the ODIN screen to start the process. Now the flashing process will start on your phone and this will take some time. Step 6. Once completed, your phone will reboot. Step 7. Now visit the Google play store and install the Super SU app on your Norte 5, and run to get the root access. Step 1. Download TWRP 2.8.7.1 for SM-N920T/N920P form here and save it on your desktop. Step 2. Again boot your phone in download mode (As mention in above Step 3) and run the DOIN app and click on the AP button. This time select the tar.md5 TWRP file and start the process. That’s it. Now your Note 5 is rooted andTWRP recovery is installed.